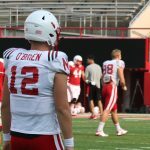 Sophomore Patrick O’Brien, the only quarterback not to speak with the media on Tuesday, missed Thursday’s practice and has been granted a release from the Nebraska Football program, per multiple sources. O’Brien then confirmed the news himself on his own Twitter account. 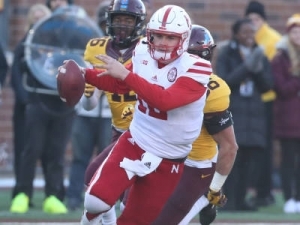 O’Brien was Nebraska’s only eligible quarterback on the roster with in-game experience. A native of San Juan Capistrano, CA, O’Brien appeared in three games during the 2017 season, completing 18-of-30 passes for 192 yards and one interception. Most of those reps came in the Huskers’ 54-21 loss at Minnesota on Nov. 11, 2017. O’Brien played the entire second half in place of the injured Tanner Lee, where he completed 12-of-18 passes for 137 yards. Patrick O’Brien has been granted a request to transfer from Nebraska. 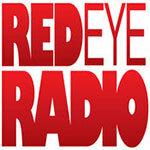 The news was confirmed shortly after practice on Thursday. Photo via Huskers.com. O’Brien was recruited by Mike Riley’s staff to operate in a pro-style offense. Scott Frost’s offense requires a dual threat QB who can both run and pass, meaning O’Brien will likely land somewhere with a more pass-heavy system. Quarterbacks coach Mario Verduzco said O’Brien had “not very many reps” in Tuesday’s practice, mentioning freshman Adrian Martinez, redshirt freshman Tristan Gebbia and sophomore Andrew Bunch as the top three QBs in no particular order. “We’ve just got to coach the guys who are there,” offensive coordinator Troy Walters said of the quarterback position. You can read more about the quarterback battle from Thursday’s practice here.